Over the past decade, there has been a pronounced age gap in American politics. Younger Americans have been the Democratic Party’s strongest supporters in both vote preferences and partisanship, while older Americans have been the most reliably Republican. The Pew Research Center’s report earlier this month on partisan identification found that 51% of Millennials (18-33 years old in 2014) identify with or lean toward the Democratic Party, while 35% identify as Republicans or lean Republican. By contrast, 47% of those in the Silent Generation (ages 69-86 in 2014) say they are Republican or lean Republican; 43% affiliate with the Democratic Party or lean Democratic. 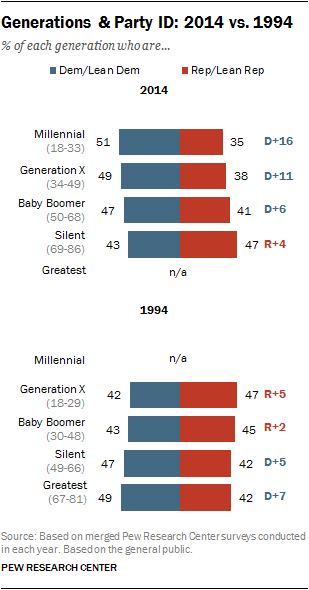 The partisan leanings of Baby Boomers and Generation X fall in between; both generations favor the Democratic Party, but to a lesser extent than Millennials. As the Pew Research Center has often noted, it is not always the case that younger generations are more Democratic. Two decades ago, the youngest adults – Generation X – were the most Republican age cohort on balance, while the oldest – the Greatest Generation– were the most Democratic. In 1994, 47% of Gen Xers (then ages 18-29) identified with or leaned toward the Republican Party, while 42% identified as Democrats or leaned Democratic. And members of the Greatest Generation (then ages 67-81) — favored the Democratic Party over the GOP (49% to 42%). 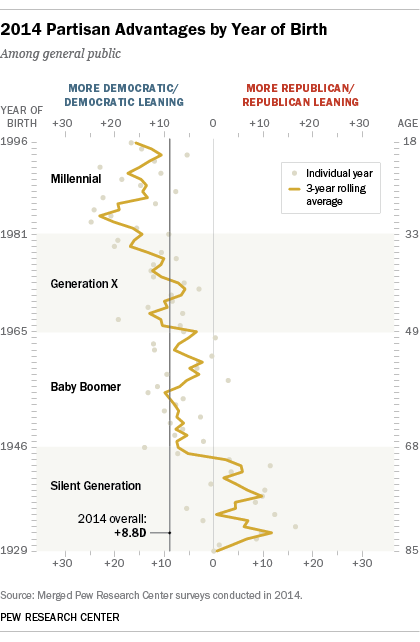 As illustrated in more detail in a 2011 Pew Research Center report on generations, the political climate of early adulthood may continue to influence the political tilt of a generation throughout its life span. For example, members of the Greatest Generation, who came of age during the Great Depression and the Franklin Roosevelt administration, carried strong Democratic tendencies throughout their adulthood. But generations cover a long period of time. 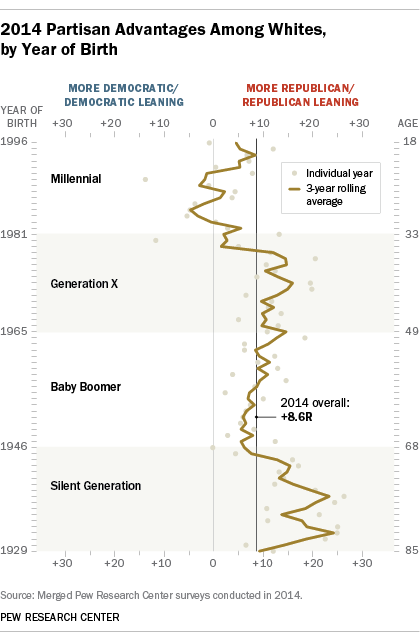 Generations typically encompass a cohort of people born over a 15- to-18-year span; for example, the Baby Boom generation includes people born between 1946 and 1964. As a result, the formative political experiences of the youngest and oldest members of each generation can differ considerably, and these differences may be reflected in divergent political attitudes and partisanship within generations. Using the more than 25,000 interviews conducted over the course of 2014 that allowed for a deep dive into party identification released April 7, we are able to see variations within generations as well as between them. The accompanying graph shows partisan leanings in 2014 for adults based on the year they were born. The line shows the percentage identifying or leaning Democratic minus the percentage identifying or leaning Republican. The further left the line on the graph, the larger the Democratic advantage for that year; the further right, the larger the Republican advantage. The overall pattern reflects generational differences in party identification. Millennials generally are more likely than other generations to lean Democratic. The Silent Generation is more likely to lean Republican. The partisan preferences of the two generations in between – Generation X and the Baby Boomers – are closer to the average partisan leanings of the public; in Pew Research Center political surveys conducted in 2014, Democrats had an 8.8% overall advantage in leaned party identification. But the differences within generations are as notable as the differences among them. Older Baby Boomers have consistently had a more Democratic imprint than younger Boomers. Older Boomers were born in the late 1940s and early 1950s and came of voting age in the late 1960s and early 1970s, during Richard Nixon’s presidency. Younger Boomers were born later (in the mid-to-late 1950s and early 1960s) and largely came of age in the 1970s and early 1980s, during the presidencies of Jimmy Carter and Ronald Reagan. Millennials of all ages favor the Democratic Party by large margins, though the party’s advantage in leaned identification is greater among the oldest Millennials. Among Millennials born between 1981 and 1986 (28 to 33 in 2014), the Democratic Party leads by 18 points (51% Dem/lean Dem, 33% Rep/lean Rep). Among the youngest adult Millennials (18 to 23 in 2014) the Democratic Party’s advantage is a still sizeable, though slightly narrower, 14 points (51% Dem/lean Dem, 37% Rep/lean Rep). To some extent, the more Democratic tendencies of younger generations reflect differences in racial and ethnic composition, with non-whites, who tend to be more Democratic in their partisan affiliation and vote choices, making up a greater share of those in younger generations. The accompanying graph shows partisan leanings in 2014 for whites based on their year of birth. Overall, Republicans held an 8.6% lead in leaned partisan identification among whites; this advantage is seen across all generations of whites – except Millennials. However, while older white Millennials are substantially more Democratic than whites in other generations, the partisan balance among the youngest white Millennials is closer to the average balance among whites of all ages. Differences in vote preferences within generations are as wide as – if not wider than – the differences in partisan affiliation. For example, over the last several decades, as measured in Pew Research Center pre-election surveys, older Boomers have consistently been more likely to vote Democratic than younger members of that generation, while older Gen Xers have consistently been more supportive of Republican candidates than younger Gen Xers. Although the combined sample sizes in these pre-election polls do not allow for examination by individual year of birth, cohorts that comprise a few years – based on the president when each cohort turned 18 – are revealing. In the last presidential election, for instance, Boomers who came of age during the Nixon administration (born between 1951 and 1956) favored Barack Obama over Mitt Romney to a greater degree than people who were slightly older or younger. Those who came of age during the Clinton administration (those born 1975 to 1982, mostly younger Xers) were significantly more likely to favor Obama than the national average, while those who turned 18 during the presidencies of Ronald Reagan and George H.W. Bush (primarily older Xers and younger Boomers) were more Republican in their preferences. 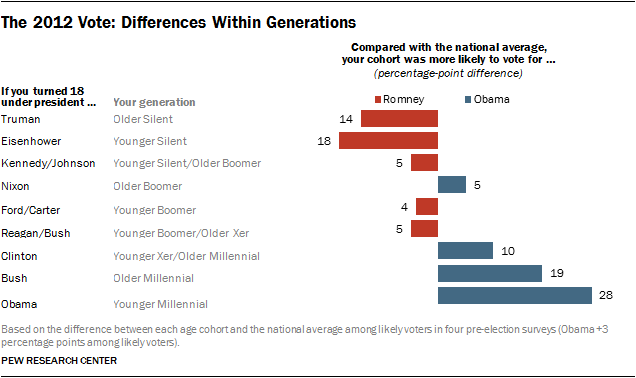 As of the 2012 election, both older and younger Millennials favored Obama by wide margins. Those who came of age during Bush’s presidency (those born 1983 to 1990, older Millennials) favored Obama over Romney by 19 percentage points more than the national average. Those who came of age during Obama’s first term (born 1991 to 1994, mostly younger Millennials) voted for Obama by an even wider margin. The youngest adult Millennials today (those currently ages 18-20, born 1995 to 1997) have come of age during Obama’s second term, and were not old enough to vote in the 2012 election.